Beatrice Galkowski and Emilia Wotton ride in the sled in front of Jake Turner. 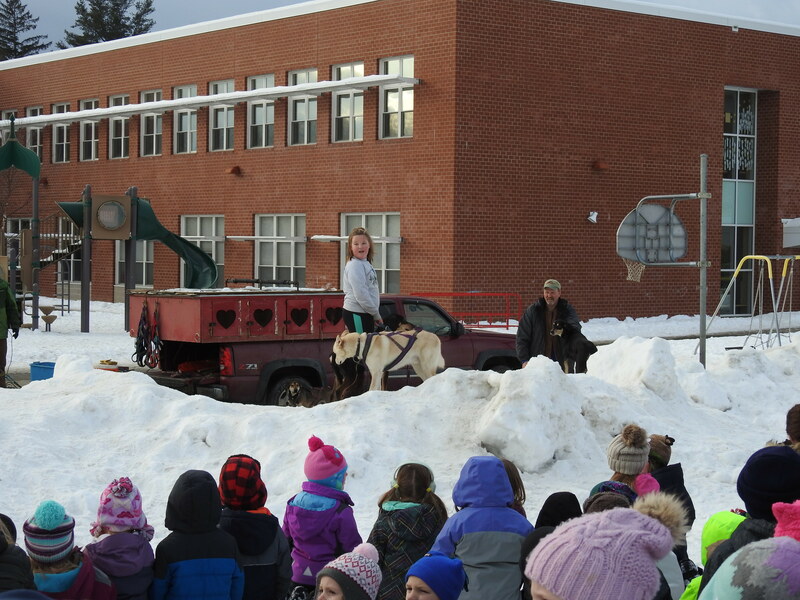 FARMINGTON - Excited sled dogs and even more excited students spent the final part of the school day outdoors Wednesday, as part of W.G. Mallett School's WinterKids competition. WinterKids is a nonprofit organization focused on getting kids in Maine and New Hampshire outside to play during the winter. One of the events they help organize is an annual competition, now in its second year, in which schools across the region host four-week-long festivals. 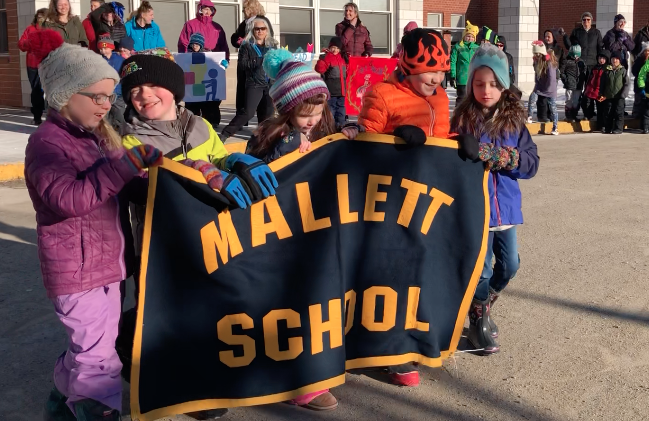 Each week, according to Mallett School Special Education teacher and WinterKids coordinator Caitlyn Coyne, has a different theme: physical activity, nutrition, family engagement and finally a winter carnival event. Schools receive points based on participation, gaining extra points from inviting guest speakers and holding special events. That's where the Turner family comes in. 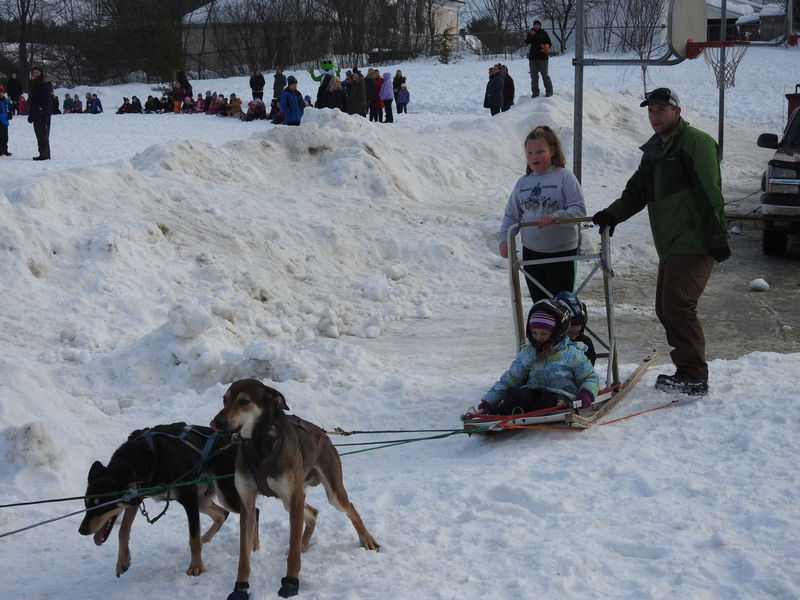 The Turners and their sled dogs are no strangers to Mallett, having previously visited as part of the school's "Iditaread" event. Jake Turner explained to the students that he raced the family's dogs at events all over the region. "Our objective is to go as fast as possible for six to eight miles," Turner said. His lead dog, Lena, could race up to 22 miles per hour, Turner said. Student names were drawn at random, with the lucky winners accompanying Jake and Rylee Turner around the playground behind an eager team of dogs. The event was actually part of last week's itinerary, Coyne said, but was postponed for warmer weather. The WinterKids series will culminate with the Winter Fun Day event at Titcomb Mountain on Feb. 1. Other components have included all-school exercises, winter nature hikes and guest speakers on nutrition. 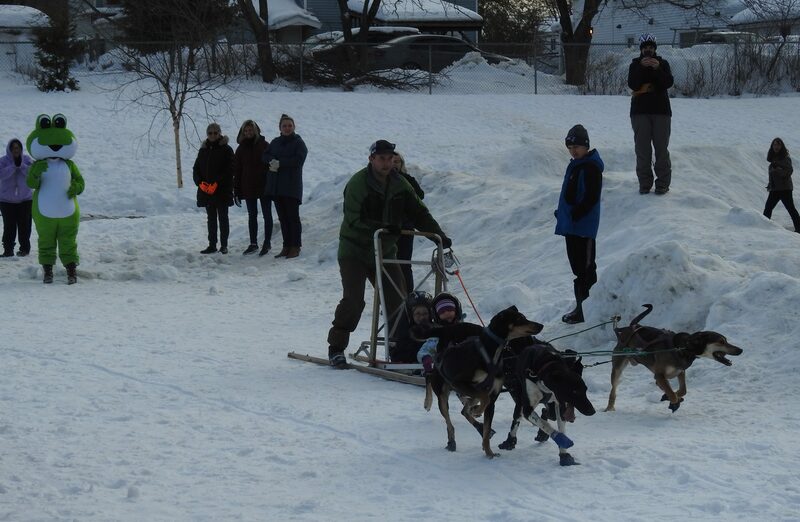 Nova Cowell-Sarofeen and Chevy Frost on the sled behind an eager line of dogs. Rylee Turner and Jake Turner are in the back. Rylee Turner and Mark Turner with two of the Turner's dogs. Who said winters in Maine weren't fun? Could anybody tell me the breed of the wheaten colored dog in the bottom photo? Thank you.